Today, MINI announced that toward the end of the month, they will send a convoy of their diminutive cars to the Arctic circle with a load of children's letters for Santa Claus. That's cute and all, but what's MINI's real rub here? First off, we heard from Climate Wire that Santa had to relocate to a U.S. Army base in Greenland after the Polar Ice Sheet melted last summer. So how do they expect to find him in Rovaniemi, way up in northern Finland? 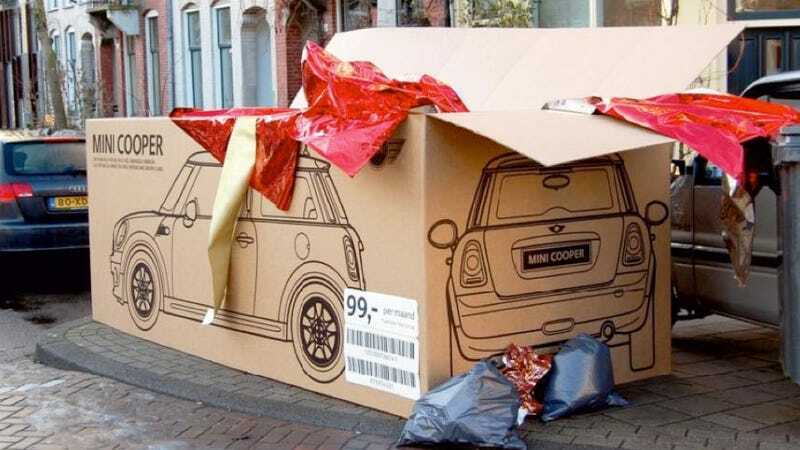 I suspect that MINI's stated intent to compile a Guinness-worthy longest ever Christmas wishlist is a smokescreen for trying to get their cars back to Santa's workshop for repairs. The cars are very clearly toys; look at them. Also, do you remember when someone left a MINI gift box in the trash pile on Christmas morning last year? Toys. But to get to Santa's new high security global headquarters, they'll need to drive across Sweden and pick up a boat in Harstad, Norway. The Norwegian Sea can be a treacherous place as winter mounts and storms rage across the northern oceans, so we wish them godspeed in their quest to meet Mr. and Mrs. Claus and their, by this time of year, hard-at-work small-handed minions.